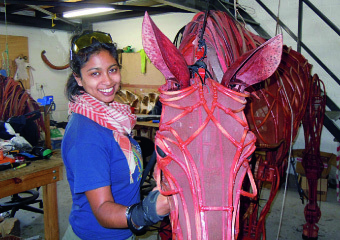 (ARISE magazine, issue 16) After providing the lifelike neighs and nuzzles that have charmed audiences of theatre-hit War Horse, Cape Town’s Handspring Puppets could be forgiven for dismounting for a while. Instead, the team is busy reviving their 20-year-old puppet drama Woyzeck On The Highveld for a US tour and organising a platform for their home town’s Out The Box Festival next year. “It’s a good time for puppetry,” says Basil Jones who co-founded Handspring with Adrian Kohler. – including horses, a goose, two or three swallows, crows and cavalry officers – takes around nine months. And with shows pulling in crowds in London, New York, Toronto, Australia, Berlin, not to mention the ongoing UK and US tours, the Cape Town workshop rarely winds down. Where there was once just Jones, Kohler and a few freelancers, there are now 20 full-time employees and part-time puppeteers touring shows abroad. Recruiting is an organic process thanks to the training programmes Handspring runs for people with no previous experience of making puppets or, sometimes, even working. “We’ve got guys that have come through from the bottom and are now making horse heads, which is highly sophisticated and skilled,” says Jones. “We’re really proud of them.” A new non-profit arm, Handspring Trust, is also reaching out to townships and informal settlements around Cape Town.